Amrine, Jennifer J.; Swanson, James A. (2004). 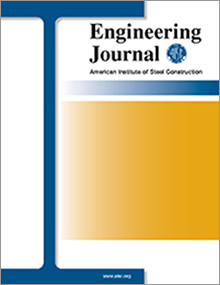 "Effects of Variable Pretension on the Behavior of Bolted Connections with Prying," Engineering Journal, American Institute of Steel Construction, Vol. 41, pp. 107-116. A series of 34 bolted T-stub type connection specimens were tested at the University of Cincinnati as part of an effort to determine if varying levels of pretension within a connection affect the connection's performance. The test program included three different lengths of A325 fasteners, one length of A490 fasteners, and three different levels of pretension. Bolts used to connect the test specimens were instrumented with strain gages and were calibrated to facilitate monitoring of bolt forces during the experiments. Independent testing of the fasteners, which included the monitoring of load/deformation behavior, was performed to verify manufacturer certifications and provide a baseline for comparing connection behavior. It was found that varying the level of pretension in the connection did not appreciably affect the connection strength but did affect the connection stiffness and deformation capacity.